see the evidence share experiences and suggest further action all welcome. 1 meter 500 by 1 meter 500 square opening by a round pipe 600mm in diameter. When the buildings of Pembrokeshire were listed Gupton Farm was missed by the Inspector. The bridge,chamber and outfall were Listed Grade Two, John Mirehouse had been awarded the Royal Society Gold Medal for Agriculture in 1800 for the reclamation of the Corse, a scheme which held the balance between agriculture the presence of many resident and migratory birds,until destroyed by the National Trust to earn £3.5 million from the beach being used for filming. 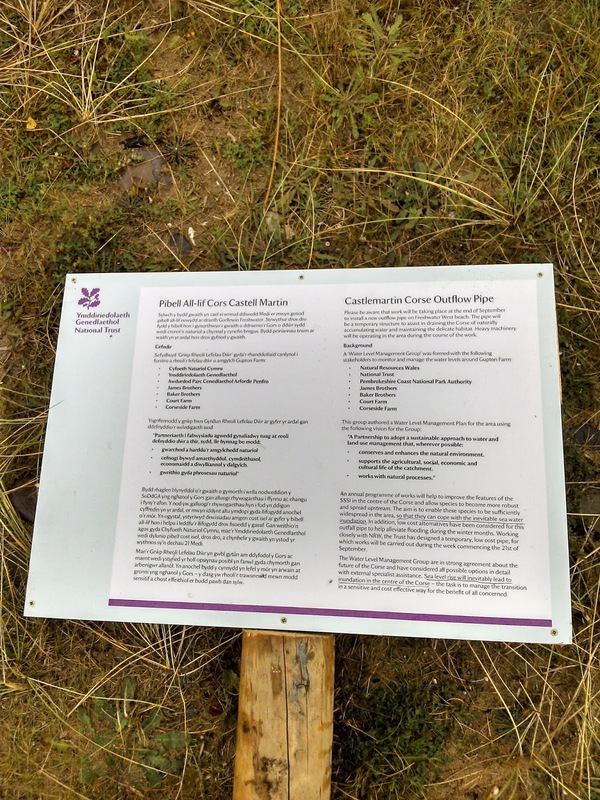 The Corse was included in the National Park as at that time there was no public access to the Calcareous Water Meadow a site of international importance to wildfowl,sadly no longer after the National Trust stopped maintaining the outfall in 1997. Johnathon Hughes statements must be treated with caution when he says that he has consulted widely and with local stakeholders. We attended all consultations there were more officers than single figure members of the public present. The first consultation in the Stackople Center was well attended but the audience were insulted by the platform,and will never attend again. Coreside Farm was the only resident in favour of the scheme as having been denied various enterprises she considers that permission for the National Trust would set a precedent for her plans. 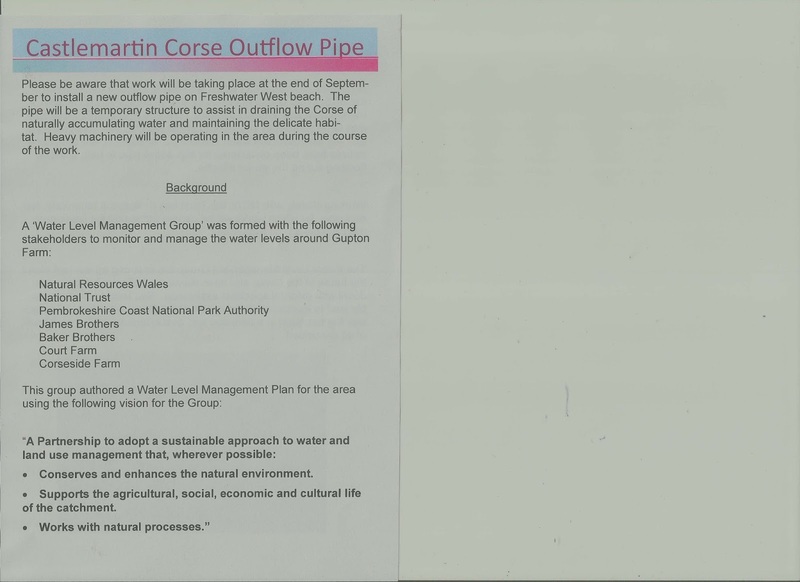 Natural Resources Wales were only consulted about water discharge,they were kept in ignorance of the full plan. Notice not National Trust Membership, not all tenants of the National Trust not all affected farmers. When asked about access charges “currently no plans in place to charge”not according to internal documents. The road has been unaltered since 1798 it was never a barrier to wind blown sand. The bridge was regularly damaged by lorries, after 20 years of effort by me PCC has erected a notice of width restrictions at the junction and since then there has been no further damage. These are all documented facts. I am writing on behalf of the Executive of the Pembrokeshire Branch of CPRW to express concern about some aspects of the National Trust’s application NP/15/0403/FUL to re-develop Gupton Farm, buildings, at Freshwater West, Castlemartin. 1. PCNPA publishes no closing date for this consultation on its web site. Gupton Farm is sited in an area where there is currently easy access to free parking and to the beach at Freshwater West. It is an undeveloped area that has not been commercialised and which should remain as such for the benefit of all. 2 Local Residents are becoming priced out of National Trust car parks and as a result, from local beaches and Bosherston Lily Ponds. I am a member of the National Trust as are many members of CPRW. We support their aims but are dismayed that in Pembrokeshire they are not an inclusive organisation. Their high parking prices tend to exclude local low income families for much of the year from the section of the coast the Trust manages, from Stackpole Quay to Broad Haven, including the nationally lauded beach of Barafundle. We will object to any charge levied for parking at Freshwater West. .The Bosherston Lily Ponds used to be a popular Sunday walk for families with children from Pembroke and Pembroke Dock. A £5 parking fee at the National Trust car park for even just one hour’s walk around the Ponds, long enough for young legs, is unacceptable. Recently when I walked there on a Sunday afternoon I met no local families; instead I met National Trust members and visitors from away. We applaud the National Trust opening up new paths and further access but are concerned that access is not universally available. The price the National Trust charges for parking is denying access to poorer families. a) That the roof lines of the buildings will not raised to an extent where they will become more visible in the landscape and visible from the beach area at Freshwater West. b) In order to maintain the integrity of Freshwater West we request that any external lighting be subdued and set at a low height so that it is contained within the site itself. 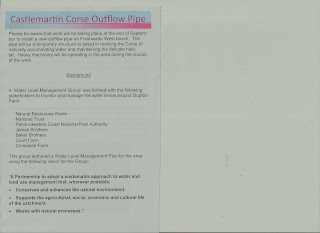 This is to protect the special qualities of Freshwater West and Castlemartin Corse. c) The camping area that the National Trust is considering will be in direct and unfair competition (being closer to the beach) with existing camp sites which already serve the area. The National Trust should not be so greedy as to operate in direct competition with local businesses. 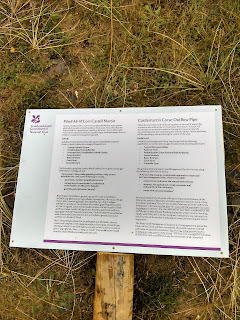 The site it identifies for camping is on an agricultural field on the west side of Gupton, within views from the Dunes and from the B4319 as it descends from the Angle Road. We object to the development of a campsite outside the existing application area. Caravans and camper vans would be an unacceptable form of development, even temporary in such a wonderfully undeveloped area. d) The car park proposed is intended at first for internal use only but the National Trust in their DAS (design and Access Statement submitted with this application) envisages that it to eventually become an alternative car park for users of the beach . Local residents inform us that the County Council’s Shoreline Realignment Project to deal with sea level rise no longer intends to maintain the B4319 which follows a route through the dunes. 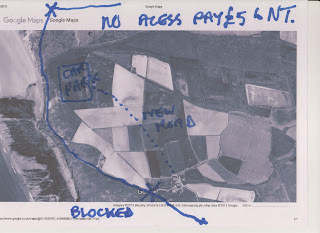 In the first instance the County Cou8ncil intends to no longer maintain the bridge over the river flowing from the Corse into the sea via the beach at Freshwater West. . People will then not be able to drive from Castlemartin through Freshwater West to the Angle road but will instead have to return to the Speculation Inn junction. Local residents understand the County Council are working to a plan devised a partnership between the National Park, the National Trust and others. 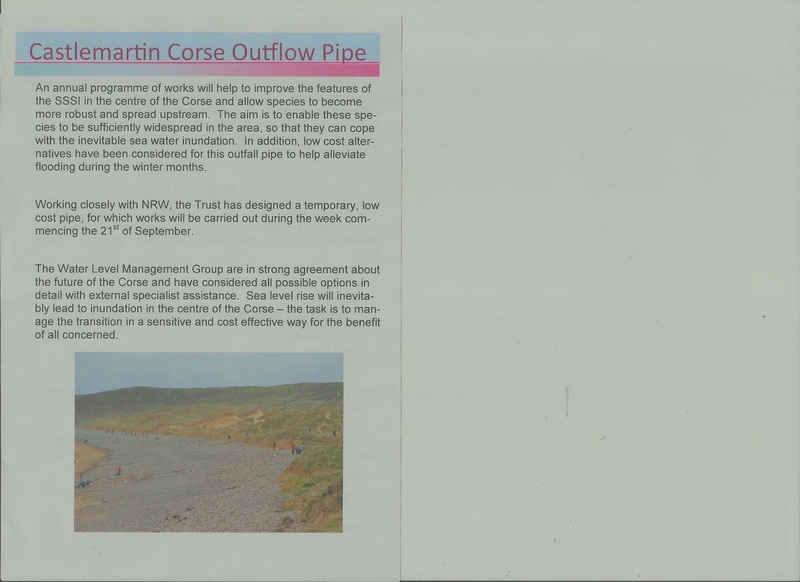 With this aim of closing the road the National Trust has already been allowed to remove the listed river outfall on Freshwater West beach which has resulted in flooding on Castlemartin Corse SSSI. Because the floods damaged local farmers’ fields they were obliged to replace the removed outfall with a plastic pipe. This is a miserable replacement for the much loved outfall. Local people believe it has been done to hasten the destruction of the road and bridge and close the road to traffic. Freshwater West is the best Atlantic Beach in the area. 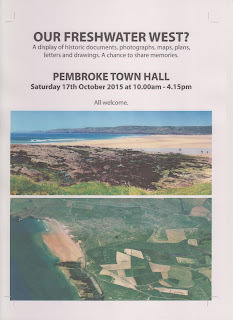 It is free to all, is easy to access and walk on, is a wonderful solace and walking area for the residents of south Pembrokeshire with its glorious dunes and seascape. Since we, the residents of south Pembrokeshire have always enjoyed free access to the beach and free parking we look to the National Park and the National Trust to be more open about their long-term plan for the area. We look for proper consultation with the local community Councils (Angle and Stackpole/Castlemartin) and with the residents of Pembroke and Pembroke Dock because this beach is in their backyard. We understand from local residents that Angle Community Council has not been consulted on these plans despite having most of the accessible section of Freshwater West Beach within their area of concern. This is unacceptable. We expect the National Park and the National Trust to continue to provide free parking and free access to the beach and dunes if with their partners they close the road. We also expect roadside parking to be available as usual on the remnants of the road for those who just like to drive and sit looking at the view. This is especially important for disabled people and the elderly with mobility problems which prevent them from moving with ease into and out of a vehicle. They prefer to remain in the car with a view of the beach as at present. They can no longer do this at Broadhaven as the National Trust has moved the car park off the main section of headland to an area where the beach is no longer visible from a car parked in their car park. It is understandable but there should be room for both approaches. e) Page 13 paragraph 1 of the DAS sets out the objectives of the proposed project, one of which is to be a market leader in high quality land and water based activity holidays. But firstly Freshwater West is an extremely dangerous bathing beach. We were regularly warned as children not to swim there. A school friend’s little brother drowned there while paddling in the shallow surf, sucked out and under without any warning. There used to be a red flag and a warning sign at the point of access to the beach. The attraction of Freshwater West is not the dangerous waters, but the views of its wild seas, the rolling waves and hissing surf, its dune landscape, and its quiet, large beach to walk along. It should not be developed in any way for water sports and recreation, as that would detract from its best asset- the wild Atlantic sea and beach, uncommercialised in any way. This is an area where south Pembrokeshire residents can find solace and renewal. Freshwater West should not be sacrificed to development to make money for the National Trust. That would be unsustainable and a blot on this special corner of Pembrokeshire. f) In the same paragraph its vision speaks of ‘ provision of facilities for disabled features’. and ‘brand marketing for the National Trust and Pembrokeshire’. Freshwater West should not need to be developed to give a brand name for the National Trust. Its land and seascape is all the brand it needs and it ahs that already. And what are disabled features that the DAS refers to? g) We are dismayed that the huge dune backing the beach and north of the river has been left unplanted by marram grass following the damage done to it, which local residents claim was by film makers. We cannot understand why they were not obliged to stabilise the dune after using it. Surely there has been a suitable season to plant since it was bared. 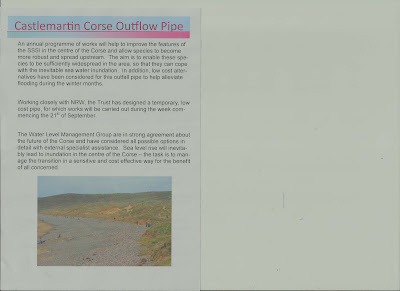 Local residents believe that the partnership wants the wind to strip the loose sand and blow it inland to help to hasten the sea’s invasion and a re-drawing of the coastline to their plan. Unfortunately the wind-blown sand may well score the solar and thermal panels proposed at Gupton, the solar farms at Hoplass and Wogaston over the Angle ridge and solar panels on homes in the area. We ask that the destruction by neglect of the dunes be stopped and that marram grass is replanted on the large, bare and exposed sand dune to stabilise it. We appreciate that sea level will rise, and we see a need for preparation for that event, but we object to it being artificially hastened..
h) Closing the road by refusing to maintain it and the bridge will isolate Castlemartin from Angle, and make the experience of the coastal ride, from wonderful Atlantic wildness of Freshwater West to settled quiet bay at Angle a thing of the past. We do not object to the redevelopment and re-use of the buildings as long as they remain discreet. We ask that outdoor lighting at the re-development be subdued to protect the integrity of a very special place. We will object to any attempt to develop the beach and dunes for recreational purposes. We object to the projected camp site and request a condition to prevent it being developed on the agricultural field identified because of the adverse impact on the special quality of this area. We will object to any attempt by the National Trust and County Council to charge the public for parking. We ask that you require the dunes to remain protected. The sea has not yet reached a level to invade so we are disappointed that the County Council is already withdrawing maintenance to close the road before it is absolutely necessary, to the detriment of south Pembrokeshire residents. We will object to any commercialisation of Freshwater West. We look to a planting regime which uses species found locally, in keeping with the dune landscape. Chairman of the Pembrokeshire Branch of CPRW.